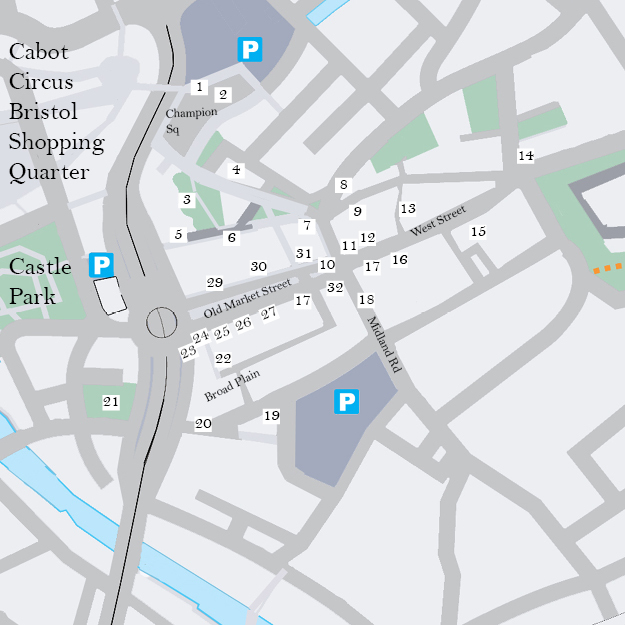 The Old Market Quarter Heritage Trail explores one of the first parts of Bristol to be built around the Castle. Parts of the area today can be traced back to 900AD. It was the market district of the city and it’s original street layout has been preserved. Walking the streets will take you on a tour through the centuries, as each building offers fine examples of architecture from it’s relevant period. As the city grew, so did Old Market Quarter and during its heyday, many famous people visited and many events took place – from the greeting of visiting royals, to providing the backdrop for riots, harbouring pirates and attracting wealthy merchants. Over the years, Old Market Quarter has seen everything – from vice to virtue. 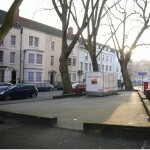 Champion Square commemorates the famous family of 18th century Bristol merchants. 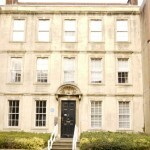 In the Square is Champion Court, one of the oldest Quaker workhouses, built 1698-1700. Weaving was carried out here until 1721. In the 1860’s a mission & school was based here. 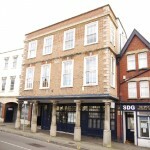 The building was converted into flats in 1929. 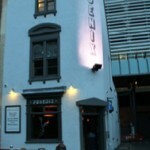 Opened first in 1850 The Phoenix is a trendy grade 2 listed Pub. Although the interior has been updated, you can find an original glasswork set as centrepiece behind the bar which was found and restored to its former glory!. Known in the eighteenth century as “Captain Parson’s Field”, this area of open land was formerly a burial ground. The Park, opened in 1886, was named after the nearby St Matthias Church (now demolished). This charming tavern on New Street is one of the few surviving early eighteenth-century buildings in the area. Known as the Volunteer Tavern since at least 1871. Born in this fine Queen Anne house in 1769, “Tommy” as he was known locally, was a child prodigy who by the age of ten was already charging for his portraits. He went on to become the leading English portrait painter of the Regency period and President of the Royal Academy of Arts, London. Sir Walter Scott, Royalty and the fashionable elite were just a few of his subjects. In his famous gym Amir and the Esmaeli family trained top Olympic, Commonwealth, MMA (Mixed Martial Arts), Rugby and Boxing athletes such as Glen Catley, Sid Lawrence, Ross Hale, Danny Bulter, Leon Rattigan, Ronnie Mann, Che Mills, Nigel Redman and Dean Francis. Amir passed away in 2005. This building dates back to the 19th Century orginally built for the Redcross Brewrey which ran until approxatly 1911 when it was built by Aston Gate brewrey which itself was bought by famous Georges Brewery in 1930s. 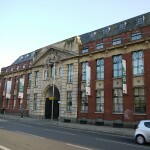 The building (as in this picture) was occupied by General Electric company till 1957 as their building on Victoia Street was damaged in the war. 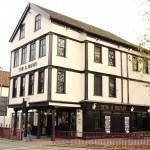 Built in 1844 on the site of the city’s bullring to serve the rapidly growing population of St Philips. 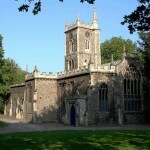 The church gave its name to the surrounding parish of St Jude’s. Now converted into private residences, the exterior is decorated with amusing carved gargoyles. Guild Heritage House built in 1913 was the first building in England to be constructed for use for disabled people. The building was called Guild for brave poor things. 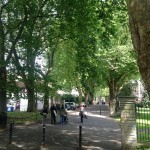 This is the site of the Gate from London into the city. The site where Royals were met, armies invaded. The Great ditch and the gate were one of the cities greatest defenses. 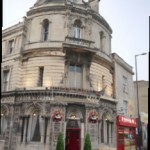 Bristol’s finest Victorian pub, built in 1869 in anticipation of a new railway terminus that never came. The exterior is decorated with unusual Assyrian-style figures. The lavish interior retains many of its original features. 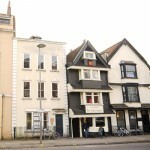 In 2000 the building was restored by Thomas Brooman CBE, co-founder of WOMAD. It is now a cabaret bar. 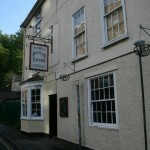 Lamb Inn est 1651 was the Inn at the main gate to Bristol on the London way. In 1761 it became notorious for stories of poltergeists & witchcraft which TV Shows & books have been written. In 1905 the site was redeveloped but the basement & parts of the Inn remain. Named after the date it was first a pub (1775) this listed building has been a pub ever since. In the 1970’s & 1980’s it was called “The Green” & was a music venue playing host to some of the days famous & infamous punk bands. 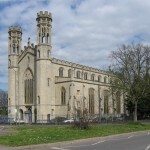 An outstanding example of a Gothic Commissioners church was designed in 1829 by Thomas Rickman & Henry Hutchinson. Holy Trinity Church closed on the 6th April 1976. 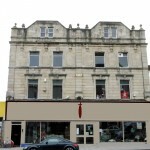 This reopened as Trinity Community Arts providing an outlet for local youth culture, hosting nights of dub & reggae. The venue went on to host artists like U2, Crass, The Cramps, Echo and the Bunnymen, Joy Division & New Order. 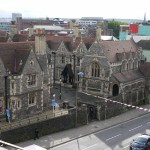 Trinity gained international fame as an important landmark in the globally exported Bristol Sound, playing host to Roni Size, Smith & Mighty & Portishead. 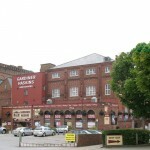 It is still a leading music venue today. Walking back up this street you are walking the path where in 1574 Elizabeth 1st & 300 courtiers arrived in Bristol and were met. 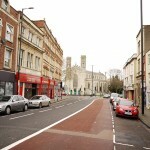 This was London Way and used to be in the county of Gloucestershire.The Street is lined with rich architectural heritage and it’s layout shows how the city grew out. 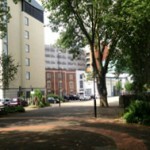 West Street has played host to hundreds of years of Royal Visits, the Olympic Torch relay, invading armies, civil celebrations & unrest which has shaped the area & Bristol. Built in 1537 both were restored in recent years. 14 West Street was home to Avent Military stores, as the pavement sign states. In later years it was home to the local bakery run by Brian & Mary. On the 1st floor was Eric Hardy, a turf accountant(betting office), until a fire gutted the building. 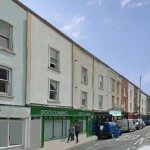 The Globe Inn is recorded by Rocque’s 1742 plan of Bristol as being located in a yard off the west end of the southern side of West Street, Old Market. Nos.8-10, West Street, a pair of early 18th century houses may incorporate part of the inn. 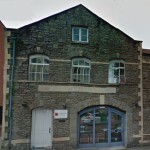 In 1992 The Aled Richards Trust (HIV Charity launched Nov 5, 1985) moved in merging with THT in April 2000. 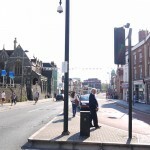 A thriving high street for decades & home to many famous companies, Midland Iron Works, an iron foundry which had been part of the area since Victorian times, Staddons Restaurant run by the famous Punch & Judy show family, world famous Heals Circus & Bristol’s Midland Railway Station. Founded in the 1820s, Gardiners consolidated it’s business premises in the 1950s, buying Christopher Thomas’s Soap Work’s maker of the famous Puritan Soap. 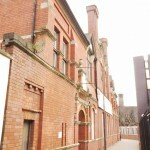 Thomas’s Soap Works had been built during the second half of the 1800s, by architect William Gingell, in a style known as Bristol Byzantine, red brick with Florentine inspired castellation & towers. 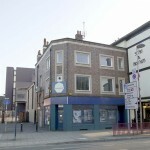 A broadcaster of Radio & Television for 60 years & these offices were the largest branch in the UK. There is no doubt of the contribution Rediffusion made to broadcasting, electronics &music worldwide. In 2015 the network is being used again in a cutting edge smart city project. 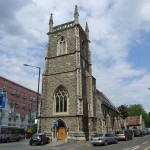 Historically the “‘Mother church of East Bristol”, this is one of the city’s earliest buildings. Founded in the tenth century outside the city walls as a priory church, it was rebuilt by Robert, 1st Earl of Gloucester (d. 1147) and subsequently extended and altered. Of particular note are the Norman font and the fine barrel-vaulted ceiling made from oak granted by Richard II. Designed by architects Foster and Wood (Colston Hall, Grand Hotel, Foster’s Almshouses) the hall was built in 1889 as HQ for the Loyal Order of Ancient Shepherds. Their annual meetings were impressive events. The hall was also used by the Irish National League and the Socialists’ Society. Built as a wealthy merchant’s house around 1670 but with fifteenth-century foundations. Inside are a fine oak staircase, a secret room with trapdoor and a remarkable Victorian water pump. The ancient Pie Poudre Court, which dealt out summary justice to market-day offenders, was proclaimed from this site from medieval times until 1971. The Beavis Water Company was based on this site till the second world war when it was bombed & the explosion rocked the area. 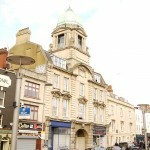 In recent decades it was one of the first club venues called Castro’s now home to The Exchange. 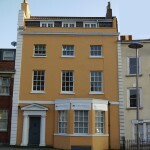 Next door, number 68 Old Market, was home to members of the Champion family, well known Quaker merchants, who owned important brass, zinc and porcelain factories in Bristol during the eighteenth century. Built in 1912 for the 4th Battalion Gloucestershire Regiment on the site of a sugar warehouse and refinery. On15 July 1944 racial tensions between white and black American soldiers, stationed here, erupted into a brawl. 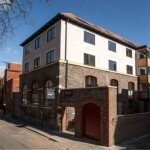 The Drill Hall is now luxury apartments. 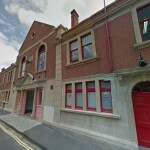 Built in 1706, this fine brick building was restored in the late nineteenth century for use by the East Bristol Conservative Party. 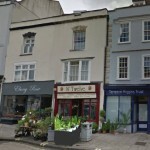 It was subsequently used as HQ of the Bristol Independent Labour Party, who named it after Charles Kingsley, famous priest, historian and novelist (1819-1875). 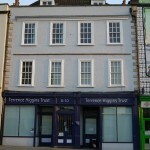 The building is currently used by “1625 Independent People”, a young people’s charity. A seventeenth-century building with Georgian additions, a tavern has existed on this site since the eighteenth century. 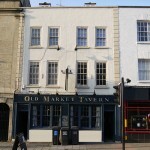 The current Old Market Tavern was created in the 1970s when “The Bunch of Grapes” public house and the adjoining “Don Café” were knocked together. The venue has been beautifully bought back to life by current owner Richard Evans who has been running the venue since 2009 and has made the venue a great home for the community. In 2014 this venue became a free house. Opened in 1924 this huge building served as a Methodist Mission Hall. It was to act as ‘”an open door to provide a free and unconventional service to the masses of people who aimlessly wander the streets’”. It regularly attracted congregations of over 2000 people. The vast interior hall (now demolished) had a domed circular roof, graceful galleries and a large central organ. 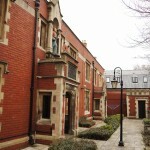 Trinity Almshouses and a hospital were founded on either side of Lawfords Gate by Alderman John Barstaple in the 1390s. Trinity North Almshouses were rebuilt in 1913 but incorporate a much earlier statue of their founder. The building is now private residences. Founded by Alderman John Barstaple in the 1390s on the South side of Lawford’s Gate. 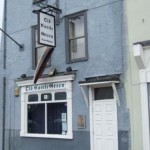 In 1574 Queen Elizabeth I was met here by the Mayor and Council at the start of her visit to the city. Rebuilt several times, the present buildings were built in the 1850s and 1880s.